When a chef tells you to "eat the eyeball," you know that you are in for an interesting evening. Chef and Roti Rolls owner Cory Burke gave us that lovely bit of information as we were handed the fourth course of a satisfying and experimental six course meal at the latest Charleston dining experience, The Green Door. If you are intimidated by upscale restaurants, but love a well-crafted meal, then Burke and the Roti Rolls crew have the perfect place for you. The Green Door is a tucked away eatery connected to one of the most notorious dive bars in town, Big John's. The restaurant is full of dive bar character - eclectic artwork, random books and trinkets on the shelves, a pool table and oddly colored walls. It's the kind of place that begs for dim lights and deep conversation. It's a good use of the space. 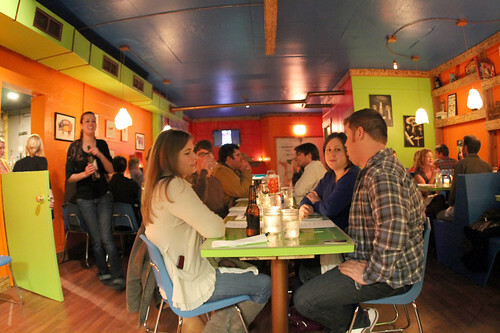 The Green Door's pop up preview dinner was a comfortably packed affair. The menu featured everything from curried pumpkin sweet potato soup to beef tongue, with wine, liquor and beer pairings. Spiced chickpeas greeted us at our tables, along with a delicious gin, bitters and St. Germain cocktail. Before our first course, Burke told us that The Green Door is "an extension of Roti Rolls" and there are "no rules." He's right. As the pop up dinner progressed, it was evident that The Green Door is allowing the Roti Rolls experience to reach its full potential, pushing the definition of "street food" to its limits. 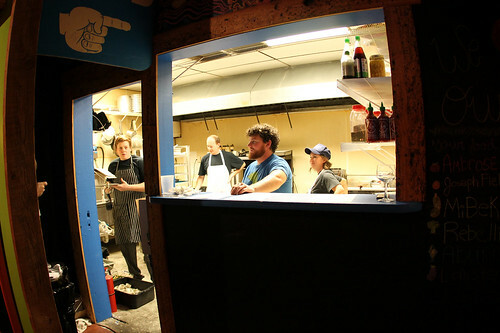 Like its food truck origin, The Green Door is all about being local, fresh and spicy. 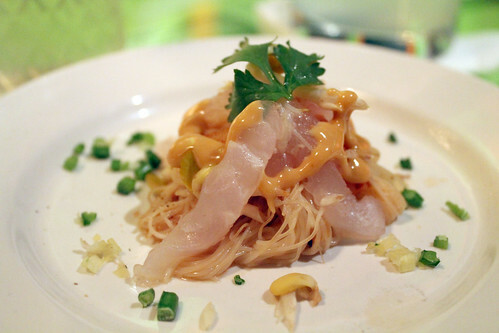 The first course featured local porgy fish and was excellent. Even better was our second course, the Curried Soup with Cilantro-Ginger yoghurt. It had a little bit of heat in its after-taste, and was perfect. 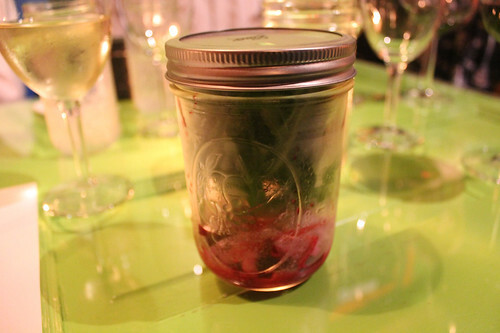 One of the most talked-about courses was the third - a Pickled Beet and Arugula Salad, in a mason jar. The dish was served with plastic forks and was paired with white wine. It was so tasty it could have been a desert. Things got a little weird from there. The fish head, complete with the eyeball, didn't fare so well with my table mates. Its novelty and quirkiness overpowered the taste. 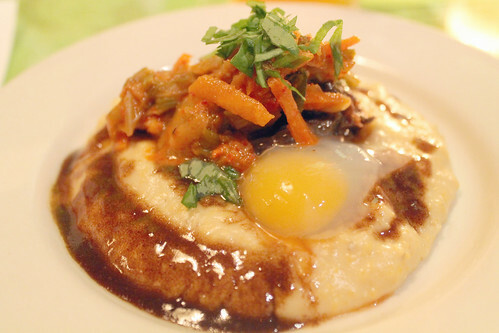 The fifth course - braised beef tongue, quail egg, cheddar grits and kimchi - was a little too salty. The dessert was absolutely delicious, though, and finished off the dinner well. 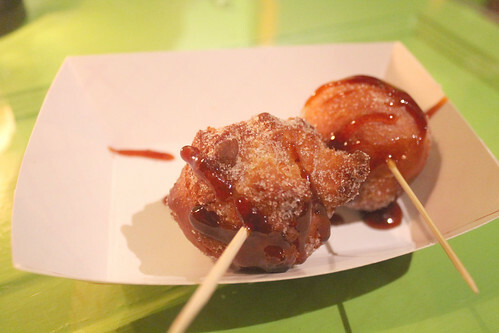 The Chinese Buffet Inspired Donuts with a delightful Strawberry Sriracha was sweet and spicy at the same time, even if it was a little too much to take with its pairing, Grand Marnier. Overall, The Green Door's dinner and its ambience were impressive. The venture is a smart move for Roti Rolls, because the food truck scene seems to be a little too content with itself. Bravo to Burke for expanding Roti's vision. Perhaps other food trucks with follow suit. Update December 4: The Charleston City Paper's Stratton Lawrence was also in attendance at The Green Door's preview dinner and has nothing but good things to say about the food, space and concept. Hop over to the Charleston City Paper for some additional photos and words. The comment section if filling up with good reviews as well - looks like The Green Door is going to be a nice little addition to Charleston food scene.